Last year I arrived at my school on Friday, they told me, I would commence teaching, Monday–2nd Grade. My heart: panicked, ached, worried, angered, cried, smiled, bewildered :all over itself. I was all of those and then some. I was more afraid of my students than they were me. Steven sums up my entire experience with second grade. Yoyo is holding his hand up and Steven is to Yoyo’s right. I learned Steven’s name my first day of teaching. He was a poor student, a jokester, mischievous–everything a 7 year old boy is, Steven was– most of all: terrible at English. However, there was hope. He wanted to try –always his absolute best. Sometime around last December his class began calling me Miss Teidi [Tidy]. They learned the word tidy, loved saying Teacher Heidi and then put the two together. At first I was puzzled if I liked or disliked my ‘pet name.’ It stuck. School is beginning to close. June will sew up the year for me as a teacher. A teacher suggested I do a play, which teaches the students about Thanksgiving…not quite the USA holiday but about giving thanks. I did decide to make the USA holiday into a play and am now practicing just that– with all my classes. [In China many of the students can only spout off memorized sentences and cannot think or speak from their heart. I have broken through this in my classes and my students are doing less &less memorized speaking –more &more heart speaking. Today I asked the class &gave suggestions about what they could be thankful for –they were all able to answer on their own. Steven waited patiently for me to call on him, he was one of the last. Me: Steven, what are you thankful for? Steven: I am thankful for Miss Tidy. My heart smiled with the brightest tear. 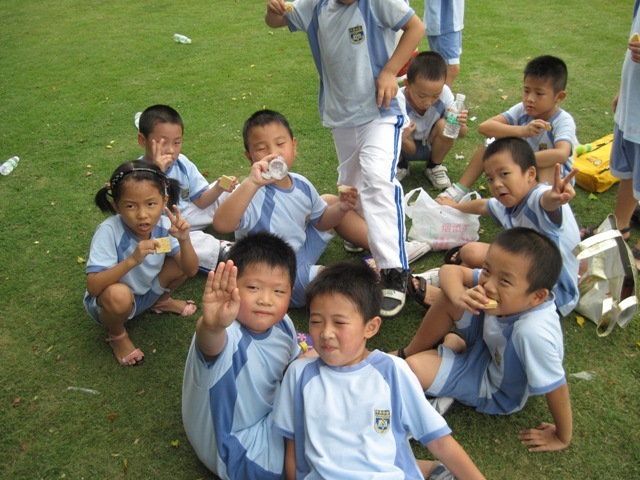 This entry was posted in Uncategorized and tagged children, Chinese students, gratitude, learning. Bookmark the permalink.